Where Will I Put the Bottled Water? When we were in class on Wednesday night, Hurricane Joaquin seemed to be headed straight for Virginia. I’m pretty well prepared, but I donated last year’s bottled water stash in the spring. So, on Thursday morning, I stopped at Target to stock up on bottled water which is now sitting in the hallway because I don’t have space for it. The latest forecasts show that I didn’t really need to rush and buy water; Joaquin isn’t likely to reach the East Coast. But, thoughts of hurricanes inspired a map. 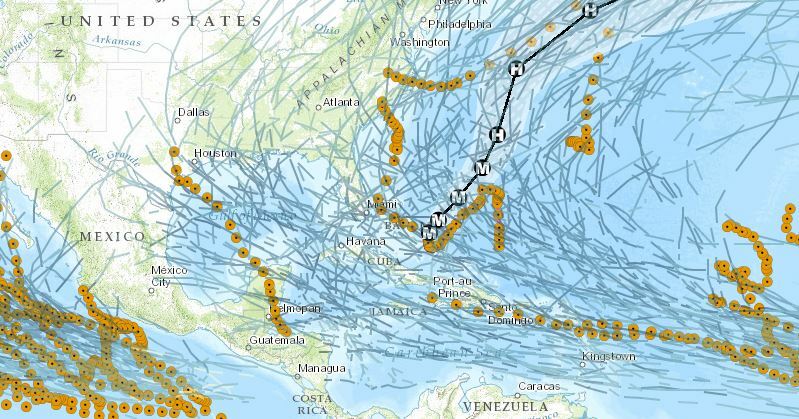 I mapped esri’s active hurricanes and recent hurricanes as well as hurricane tracks from historic hurricanes (in blue, from Maps.com) on top of a base map. Hurricane Joaquin’s path is shown in black, while the yellow dots represent the tracks of recent hurricanes. As you can see, we might be safe from Hurricane Joaquin, but (historically speaking) it’s only a matter of time until a hurricane does hit Virginia. You can see the ArcGIS Online map here. I think I’ll keep the water. Hi, I’m Sara Lubkin. I am a GIS certificate student at Northern Virginia Community College. I am also a geologist who studies fossil insects, paleoclimate and the current effects of climate change. I earned my PhD from Cornell University in 2008 and worked in web and social media marketing for a while. I now teach introductory geology classes at the University of Mary Washington. When I’m not teaching or learning, I do research. I am currently collaborating with the NASA DEVELOP Program and the Virginia Institute of Marine Science on a project tracking harmful algal blooms (HAB) in the Chesapeake Bay. I am also a mom. For me, GIS is connecting data to geography. When non-scientists ask me what GIS is, I tell them that I put information on maps so I can better analyze and interpret. I was a scientist before I studied GIS, but GIS has allowed me to ask and answer different types of questions. Before studying GIS, my fossil insect research focused on describing new species and determining how species were related to other species and modern species. I was getting frustrated with this work and wanted to do something more meaningful. Now, I am able to connect Pleistocene fossil insect species to specific climate zones and create maps of Pleistocene glaciation. I am hoping to use this research and my work with NASA DEVELOP to transition into the study of climate change and its effects on the Earth.